Pay the surcharge and go during the Lights Festival (29-11-2018 through 21-01-2019) for an even more magical evening – It\'s worth it! We are comparing Romantic Wine and Cheese Candlelight Cruise Amsterdam Prices from leading ticket suppliers and Try to find you Cheap tickets prices on the market. Amsterdam\'s famous and beautiful Canal Belt is a UNESCO World Heritage site lined with grand 16th and 17th century houses and many picturesque bridges. At night the city comes to life as the lights are turned on, illuminating the sights and turning the city into a magical and rather romantic place. the modern barge is comfortable and exudes such a romantic atmosphere thanks to the candlelight. Enclosed in glass, with a glass roof too, you get a panoramic view of the city with all tables placed next to the large windows so everyone gets to enjoy the view. A romantic evening on the water – Perfect for couples but also family members and groups of good friends too. You\'ll need to dress up a little, there\'s a smart-casual dress code. Even if you\'ve been to Amsterdam before, and explored it in the daytime this tour is still a special thing to do. Go for the experience rather than for the \'sightseeing\' aspect as commentary is limited. Best to leave the kids back at the hotel to fully enjoy this tour, go for a romantic meal out on the town afterwards and make it a date night like you used to enjoy! 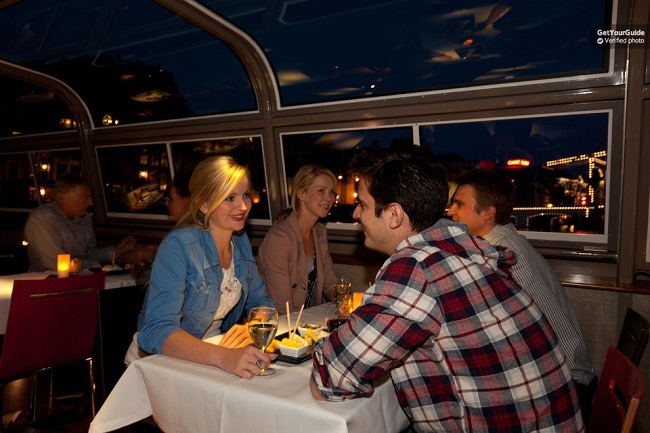 Your Experience With Romantic Wine and Cheese Candlelight Cruise Amsterdam? Step aboard the glass-enclosed barge for a romantic cruise along some of Amsterdam\'s most picturesque canals. You\'ll be able to enjoy a glass of wine and some nibbles consisting of typical Dutch cheeses, freshly baked French bread, olives, pickles, and nuts, as you soak up the romantic atmosphere, your table lit by candlelight, and admire the views from the water as Amsterdam\'s top scenic sights slide past the window. Snuggle up to your loved one and just watch the scenes unfold before your eyes as you float past historic houses and under quaint bridges or learn about what you\'re seeing with the downloadable audio guide that will give you a bit more understanding as to the history of the city. the cruise ends at the original departure point after approximately 1.5 hours. What Romantic Wine and Cheese Candlelight Cruise Amsterdam Includes? Be aware that if you\'re a couple, you may have to share a table with another couple depending on how full the boat is. Download the app before you board if you want to ensure you know what sights you\'re passing. Travelers Reviews about Romantic Wine and Cheese Candlelight Cruise Amsterdam? Travellers talking about this evening canal cruise on GetYourGuide, Viator, Tiqets, and Trip Advisor have really great things to say about it, almost everyone truly enjoying their time on the water and highly recommending it to other travellers saying it\'s good value for money. Most people were very pleased with the wine and the nibbles, being pleasantly surprised that their wine glasses were kept topped up throughout the tour. From the few negative comments, people complained that the white wine and the cheese were too warm and couldn\'t be enjoyed. Whilst some passengers had to share a table with others which made the experience less than romantic. this boat tour is not wheelchair accessible. Paper and e-tickets are both accepted. Dress up a little – there is a smart/casual dress code. If travelling between 29th November - 21st January a small surcharge is incurred due to the Amsterdam Lights festival taking place during these months which the boat goes through. You should be at the boat pier 20-30 minutes ahead of the scheduled departure time. the boat departs from Stromma Central Station Pier on Prins Hendrikkade, opposite Amsterdam Central Station.